Added care advice: Container will become hot, never place on any unprotected or polished surface. Never leave a burning candle unattended. Always leave 15cm between burning candles. Burn candle away from walls and overhanging surfaces, draughts, other heat sources and flammable materials. Burn candle out of reach of children and pets. Keep wick trimmed to 3mm, but never leave fragments of wick or match in the candle after lighting. Never allow the flame to touch the side of the glass and cease burning if it does. Extinguish flame and allow to cool before handling or moving. Burn for maximum 4 hours ata time. Please leave 10mm of un-melted wax in bottom of the glass to avoid excessive heat. Extinguish candle if it smokes, flickers repeatedly, or the flame becomes too high. Never use if there is damage to the container. Harmful to aquatic life with long lasting effects. Contains Acetyl Cedrene, Citronellal, Geraniol, D-Limonene, DL-Citronellol. May produce an allergic reaction. Avoid release to the environment. Dispose of contents/container to approved disposal site, in accordance with local regulations. 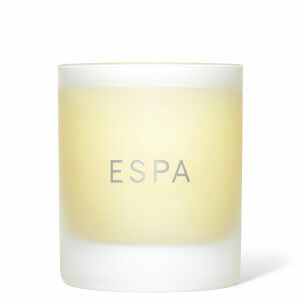 The ESPA candles are really good quality and smell wonderful. Beautiful candle, gorgeous scent too. Ideal for a soothing relaxing bath at the end of a long day. Bought as a gift which my daughter loved and said it smelt amazing. ESPA's Soothing Candle has become a holiday tradition in our home. The aroma reaches every part of the house and reminds my wife and I of the first time we experienced it, which was at the exclusive resort where we were married. Highly recommend this candle as an excellent mood-setter at holidays and other times of the year. So many so called luxury candles smell artificial and are disappointing. 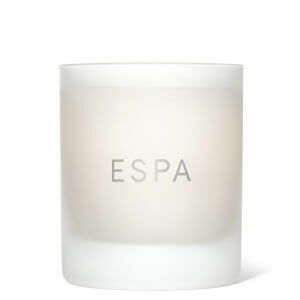 Not so with the Espa soothing candle, it's lovely perfume is so calming and relaxing. It also burns clean right to the end. Well worth the price. Not an overpowering but very pleasant and mild scent. Not the cheapest candles but nicely packaged making a really nice quality present.